May 24 , 2011: Drill hole results and a table of locations. Since June of 2016 after a four year hiatus, Platinex has recommenced activities on the Shining Tree project. 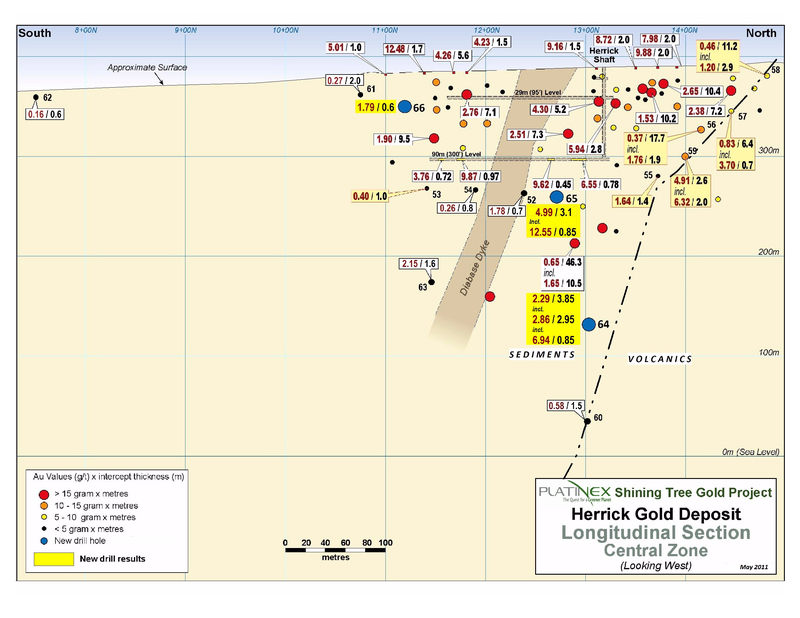 A resource valuation has been commenced on the Herrick gold deposit in order to establish a NI43-101 compliant resource including consideration of an open pit. Planning is underway to determine the supplementary exploration necessary on the Herrick deposit. Logging and sampling of core obtained in a 2012 drilling program to initially test gold in till anomalous indications has now been completed. Staking and strategic acquisitions was conducted through to June 2017 with a 500% expansion of the property to a size of 35,000 acres (14,000 ha). The acquisition activities enabled coverage of a 21km strike length on the Tyrell-Ridout Deformation Zone, a probable source for some of the gold in till anomalies. 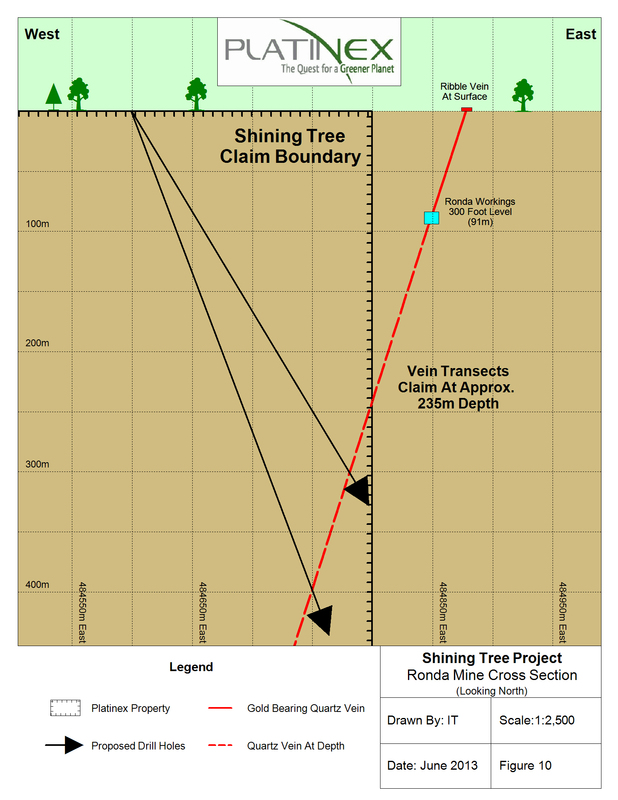 Spectacular gold counts in glacial soil along nine kilometres strike length highlights the discovery status of this zone on the Shining Tree gold property. 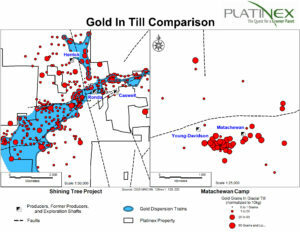 Figure 2 & 3 show comparisons of Timmins and Matachewan till results to Shining Tree and demonstrate how all of the multimillion ounce Matachewan or a large part of the Timmins camp might fit into the Shining Tree property. Historically a total of 60 holes have now been drilled on the Herrick deposit which remains open along strike and at depth. Sampling of the basal till has revealed spectacular gold contents along the length of a nine kilometre shear zone on the property. Of 430 samples analyzed and normalized to date 173 contained 10 or more gold grains, 14 contained more than 50 gold grains and three contained over 100 gold grains. The pristine grain counts are high in most cases and indicate a nearby source. Partial analyses of the fine fraction of 88 till samples revealed systematic property-wide evidence of associated mineralization correlating with high gold counts. A major discovery in place appears to be in the offing. Effective Gold Prospecting In Glacial Till explained. Slide Show – Till Geochemistry and Indicator Mineral Methods for Exploration in Glaciated Terrain. 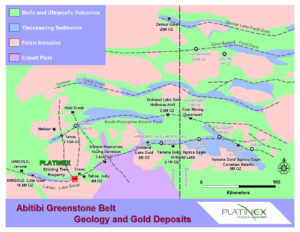 On a regional scale the property is located within the prolific Abitibi greenstone belt which is renowned for its concentration of world-class gold and Cu-Zn-Ag-Au deposits. 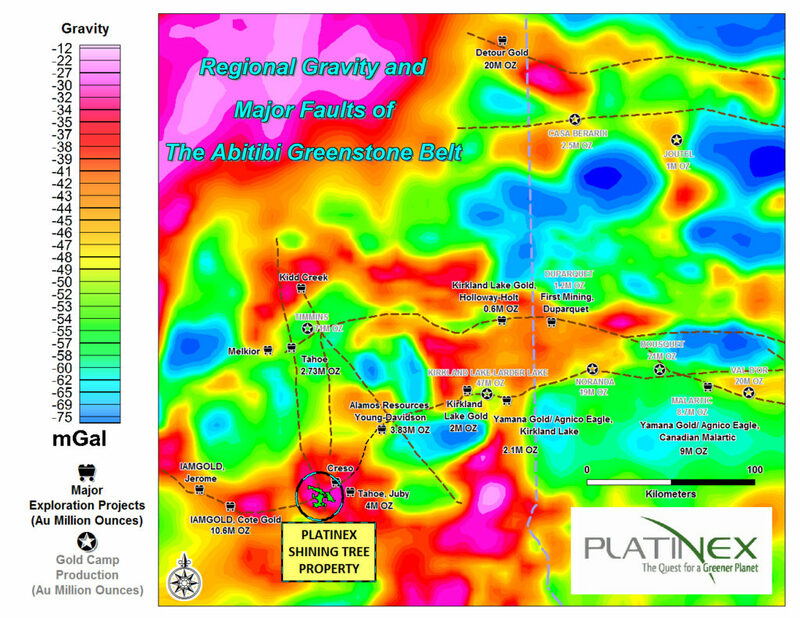 The Shining Tree property is underlain by the Tyrrell-Ridout Deformation Zone with which several world-class gold deposits are spatially associated. 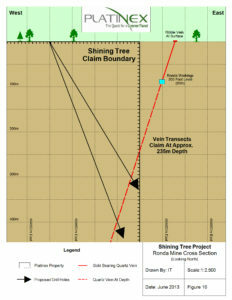 The Shining Tree property is also centred on the axis of a regional gravity high signifying an area of thick supracrustal rocks and under-plating by oceanic crust. In the Abitibi these associations are conducive to the discovery of major gold deposits. In fact the Shining Tree property is situated on the strongest gravity anomaly in the entire gold belt of several hundred kilometres length. The property is underlain by an Early Precambrian assemblage of WNW trending, steeply dipping felsic to mafic and ultramafic metavolcanic rocks as well as metasedimentary rocks and alkali metavolcanic rocks of Porcupine age. These rocks are intruded by pre-orogenic feldspar porphyries and hypabyssal diabase dikes and sills of Nipissing Age. The Porcupine or Timiskaming aged metasedimentary rocks are believed to have accumulated in a regional rift. Later south to north compressive faulting along the axis of this rift has been proposed. Major NNW sinistral wrench faults, including the Michiwakenda Lake Fault which crosses the Shining Tree property, are regional in scale. 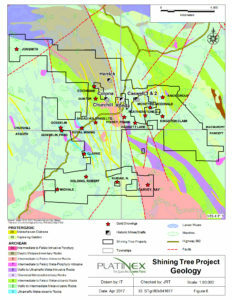 Related subsidiary parallel shears and possible splays carry significant gold mineralization on the Shining Tree property. Bedrock exposures are limited on the property which is principally covered by a thin mantle of Wisconsinan till. Portions of the property display a tellurium-silver-gold association in which very high grade gold occurs within N085°E shears (Caswell). In other portions of the property the same structures display a gold-arsenic association. Some of these shear zones are cataclastic and even mylonitic. The N085°E shears intersect a system of north northwesterly trending thin sheared interflow metasedimentary rocks which host quartz veinlets and veins. Current work on the property is assessing the chemical affiliations especially through a till sampling program. The chemical composition of the till appears to reflect the bedrock chemical signature. With the high pristine gold grain counts being obtained in the till it is expected that additional in situ gold will be located with follow up exploration. 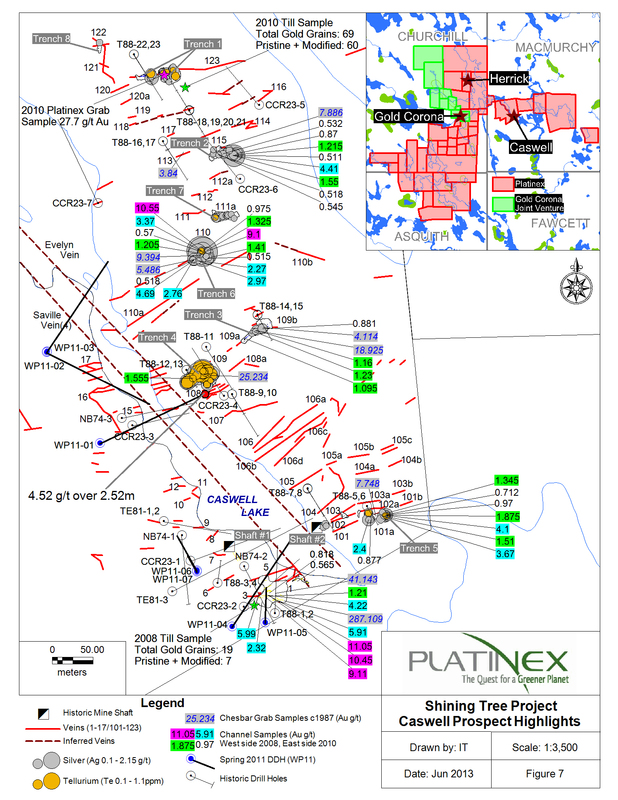 The Caswell prospect was initially evaluated by Platinex in the fall of 2010 with a surface sampling program comprising 370 channel samples and 4 grab samples. The prospect is underlain by two north northwesterly trending shears within interflow metasedimentary units and 39 documented N085°E mineralized shears. Since June of 2016 after a four year hiatus, Platinex has recommenced activities on the Shining Tree project. A resource valuation has been deferred on the Herrick gold deposit due to the perceived need for more detailed drilling. A NI43-101 technical report is being prepared currently. Further work recommendations on the Herrick deposit including recommendations to establish a compliant resource will be dealt with in the technical report. Logging and sampling of core obtained in a 2012 drilling program to initially test gold in till anomalous indications has now been completed. Staking and strategic acquisitions were conducted through to June 2017 with a 500% expansion of the property to a size of 35,040 acres (14,000 ha). The acquisition activities enabled coverage of a 21km strike length on the Tyrell-Ridout Deformation Zone, a probable source for some of the gold in till anomalies. 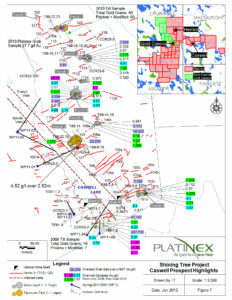 From 2009 to March of 2011, Platinex has drilled 51 holes for 6,190m on the Herrick deposit. All of the holes have returned good gold values and the deposit has been tested along a 400m strike length and to 300m depth. It is open in all directions. Results are tabulated herein. The Ronda Mine, mined the Ribble quartz vein located partially within a portion of the Platinex Shining Tree claims (Fig. 9). The vein was reported to have a north strike and 60o west dip is exposed almost continuously for 440 metres and had an average width of 1.5 metres. Two shafts and six levels developed a small portion of the vein with production mainly from the fifth level and upwards. Recorded production occurred only in 1939 and amounted to 2,727 oz. gold and 4,830 oz. silver from 24,592 tons for an average recovered grade of 0.11 oz. Au per ton in 1939. The mine was closed due to the beginning of the war and the resulting shortage of labour and has never reopened. 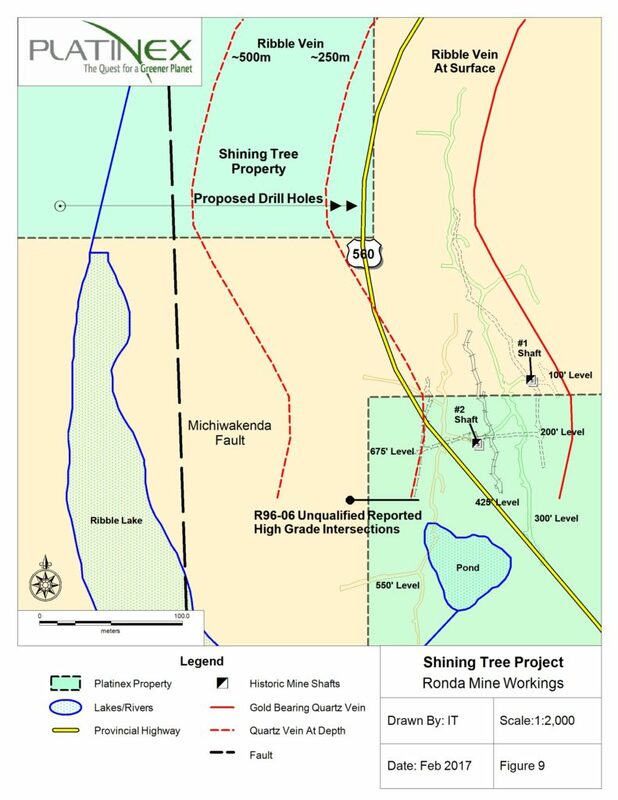 The northern half of the Ribble vein is projected to enter the Platinex Shining Tree property at a depth of approximately 235 m (Fig 9 and 10). Drill hole R96-06 drilled by Strike Minerals is reported to have tested the Ribble vein and a parallel vein with positive but unqualified results at vertical depths of 215m and 250m. Platinex claims also cover the southern portion of the Ronda underground workings. 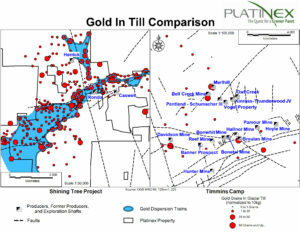 Platinex plans deep drill tests on the Ronda vein (Fig. 10) as high priority targets. 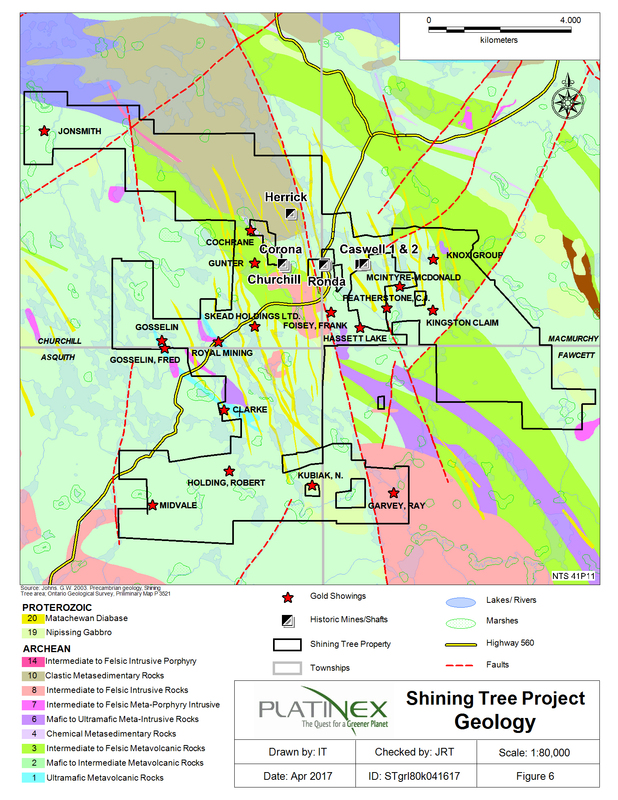 In 2008 Platinex entered into an option agreement with Skead Holdings Ltd., with respect to its Shining Tree property situated in Churchill, MacMurchy and Asquith Townships, in Ontario (“the Shining Tree property”). In April, 2011 Platinex exercised its option to acquire a 100% interest in the 144 claim units (5,760 acres or 2,304 ha), subject to a 3% NSR. A total of $3,000,000 has been incurred to date by Platinex on the property. Platinex acquired a mining lease in 2012 comprising one claim unit. 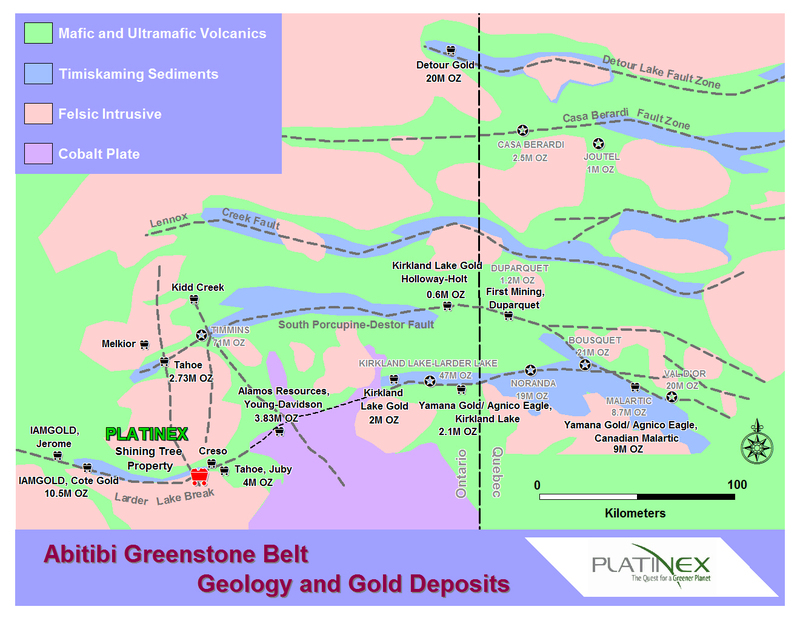 In 2016 Platinex entered an option agreement with Skead Holdings Ltd. and Ashley Gold Mines Ltd., in Churchill, MacMurchy and Asquith Townships. Under the agreement, Platinex has the right to acquire 100% interest in 54 claim units and 50% interest in 8 claim units (2,480 acres or 991 ha) subject to a 2% NSR by issuing 200,000 shares of Platinex, making property payments of $95,000 and by incurring property expenditures of $500,000 by August 17, 2020. 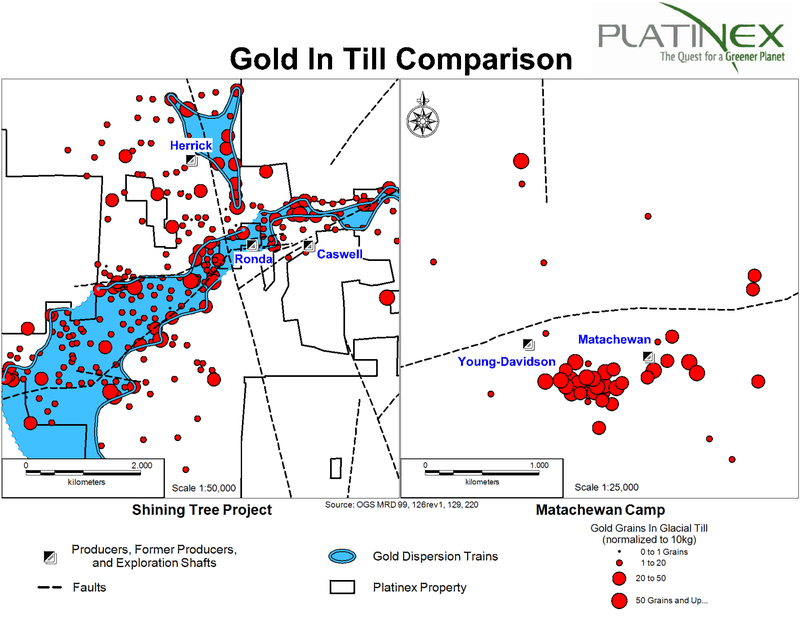 Between August 2016 and June 2017 Platinex entered into six agreements and commissioned staking to acquire 100% interest free of underlying interests in 668 claim units for 26,720 acres or 10,688 ha in Churchill, MacMurchy, Asquith, Fawcett, Connaught, Kelvin and Cabot Townships. This brings the total holdings in the Shining Tree property to 875 claim units comprising 35,000 acres or 14,000 ha.